This week has seen me have to reshuffle - it's amazing how one little change in routine has me so unstuck! I have gone back to work an extra day, which makes three weekdays, plus Saturday mornings. I will admit I have missed a few days training, but on the whole have had great success this week. I have had to switch around what training I do on what days, but tried not to over analyse it like I would have done in the past. Instead, I JFDI and didn't throw in the towel. This week saw my biggest loss on the scales so far - 1.1kg! I am now so close to goal I am determined to keep on track. Fingers crossed I can get there by DPCON12 (so I can buy a new outfit!) 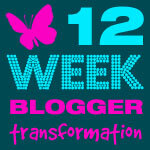 I have also met a great bunch of people this week by joining in a 12wbt facebook group workout. 10 of us met up to smash our SSS with a personal trainer and boy! Did I get complaints from muscles I never knew I had the day after! Not following the nutrition plan as closely as I probably should, but I am watching calorie intake and portion sizes. One turn around for me is that once upon a time I would run past the "golden arches' in the morning and smell the fries cooking and want some. Now that smell is repulsive to me. The running is going great - up to 28 minutes straight now and inching ever closer to my 5K fun run in April. Whether I run that whole distance or not I'm going to give it everything and know I can be proud of myself for not giving up! What are you proud of this week? Trying a new food, smashing a PB or bettering your fitness test scores from pre-season (will let you know my results next week!) Happy training everyone!